Internet of Things is an ecumenical ecosystem of connected physical objects. The physical objects that can sense, process, and communicate data with one another. We have already seen a substantial increase in the internet-connected objects with embedded sensors having an ability to process and share complex information. IoT has enabled physical objects to precisely sense their environment and communicate the same to enhance the overall efficiency of a system or a process. The widespread adoption of Internet of Things in 2016 happened as expected. According to the analysts, in the coming year, IoT will evolve beyond household devices, leading the consumer interaction segment and transforming smartphones to become IoT sensor devices. 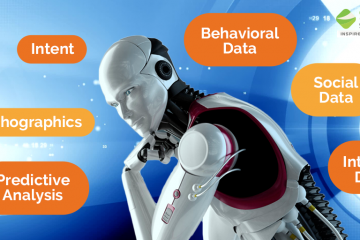 Consumer interaction will be at the forefront of IoT technology. The rise of startups adopting Internet of Things already started playing a key role in transforming manufacturing, healthcare, insurance as well as transportations and fleet management companies. The best thing is consumers are also embracing IoT technology by welcoming connected devices in their homes and onto their bodies. As more and more startups have started focusing on IoT, they have also started looking out for funds and finances to keep the game going. Therefore, it will be interesting to understand the yearly financing history of Global IoT companies. Since the end of 2014 and after 2015 witnessed a slowdown in smart home IoT funding, a surge in the number of deals of 20+ deals was recorded in the first quarter of 2016. The first quarter of this year was by far the second largest quarter of accelerating IoT Startup funding for the Internet of Things industry has evolved to new heights. 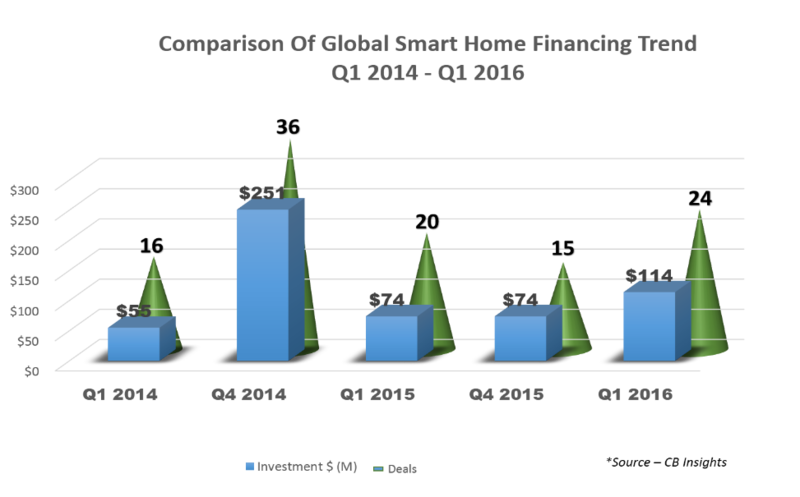 Since fourth quarter in 2014, the smart home segment in IoT was somewhat slumping. Conversely, the first quarter of 2016 was successful in overcoming this fall by recording 20+ deals in the first quarter itself. Let us look at the funding trends for private companies under the smart home segment. The chart presented below takes into consideration all connected devices, internet softwares along with security, lighting, audio, and heating focused on enhancing the efficiency and performance of in-home appliances. August Home the smart home lock maker, Netatmo the security camera maker, and Canary home-security device makers were the three major firms to crack the highest financing deals in 2015. Under Series B funding, together the amount they received was equivalent to $101 million. 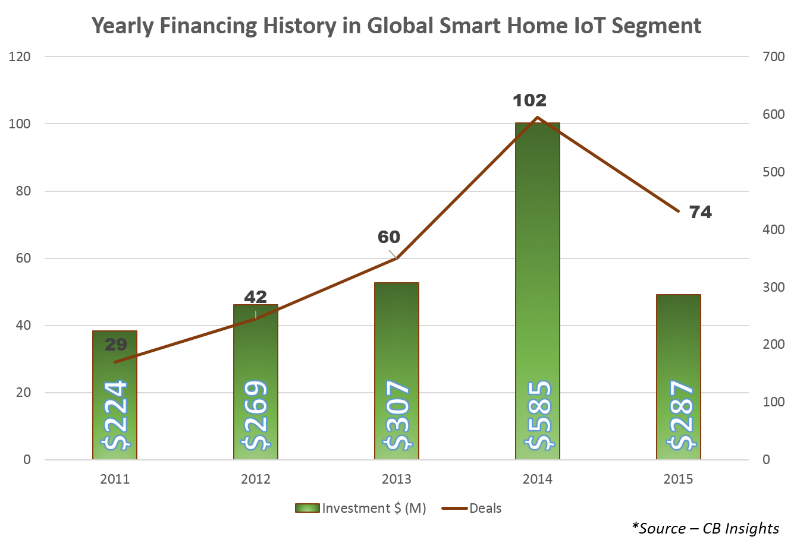 Quarterly Funding Trend of the Year 2016: Quarter one of 2015 happens to be the worst three months in the IoT era wherein the smart home segment recorded only 20 deals and a net funding of $74 million. Despite this downturn, a smart home segment in IoT bounced back showing a renewed interest of investors in the sector. The first quarter of 2016 recorded a 60% increase in a number of deals; whereas IoT funding also surged by 54%, which continued over the second quarter. Elicis Ventures, Kleiner Perkins Caufield Byers (KPCB), and Richard Branson played a leading role in $61 million Series C funding raised by the smart doorbell company Ring along with Neura a smart device platform that has raised $11 million Series A funding. 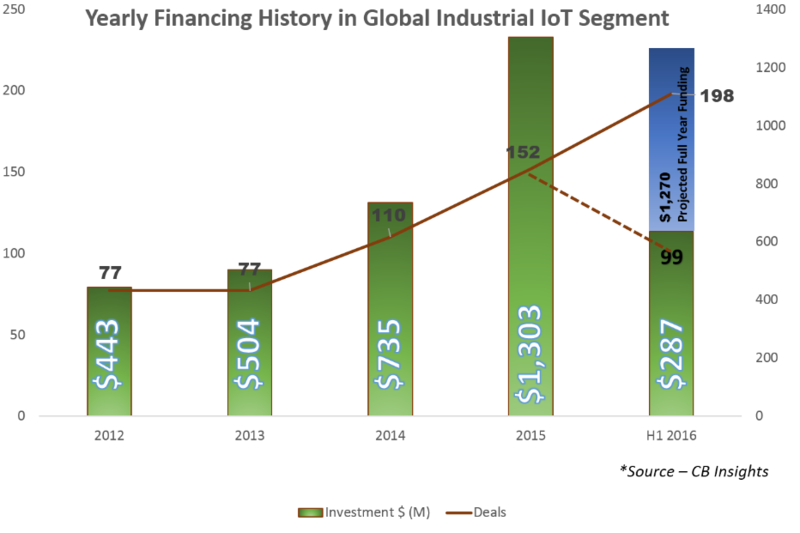 An increasing slice of overall IoT startup funding is going to the industrial sector. The startups creating apps for asset-heavy industries like manufacturing, logistics, mining, oil, utilities and agriculture have seen a strong financial activity in last few financial quarters. Although, the first half of 2016 seems to be running flat, but the industrial segment in IoT has been successful in attracting attention from some well-known Blue Chip companies. Likes of GE ventures, Intel Capital, Cisco Investments, and Qualcomm Ventures are financing IoT startups developing applications in order to gear up the asset-heavy industries. 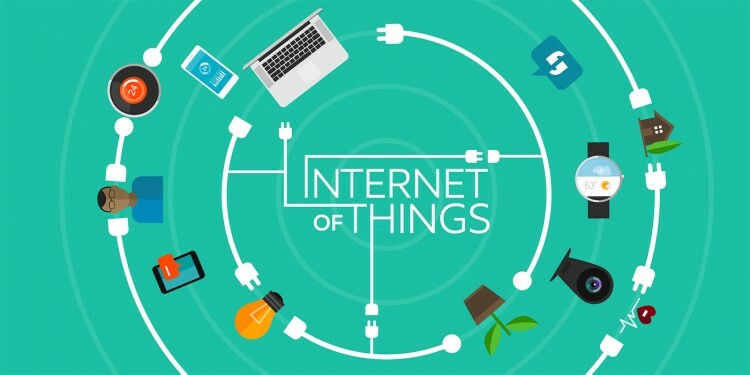 As the IoT startups shifted their focus towards different categories from networking infrastructure, sensor manufacturing to developing Big Data software under the pretext of SaaS, Industrial IoT (IIoT) has emerged as the biggest funded segment under the Internet of Things. 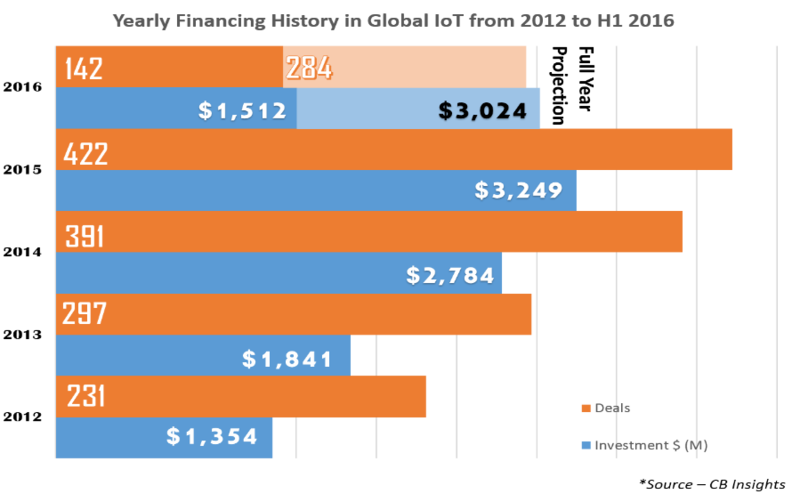 Let us look at the yearly financial trend in IIoT as the trend did start way back in 2012. Greenwave Systems an IoT software and Services Company along with Airware a commercial drone developer and Enlightened a connected HVAC and lighting company was the major fund earners in the first quarter of 2016. Together they raised $100 million under Series C and Series D financing. 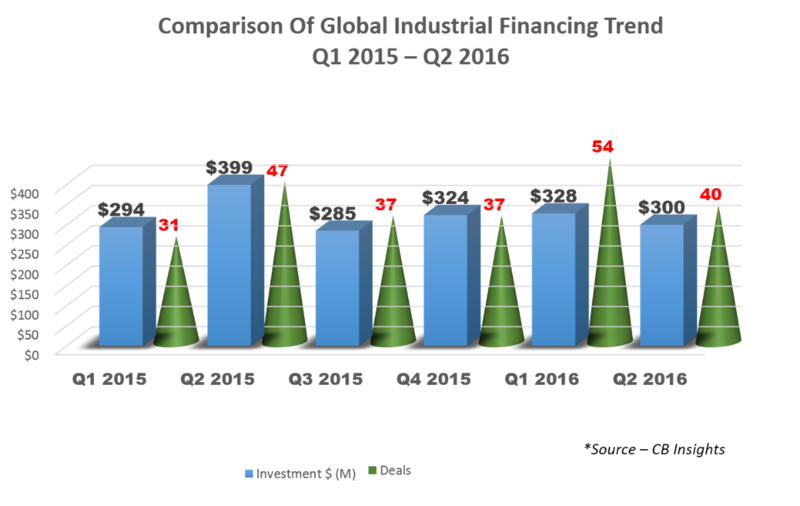 Quarterly Funding Trend of the Year 2016: After looking at the quarterly funding scenario, it seems that both deals and dollars are retrograding in the second quarter of 2016. Although the first quarter of 2016 recorded 54 deals, second quarter lost the momentum, lowering the activity by 26%, quarter by quarter. Subsequently, the second quarter of the year witnessed a decline in funding crippling from $328 to $300 million. This is about 9% decline in quarter-to-quarter funding ratio. Desktop Metal, a commercial 3D printing company, IoT platform Ayla Network and Maana an IoT analytics company together raised $99 million in the second quarter of the year under Series B and C funding. The beauty of Internet of Things is not meant for just one segment or for one particular category, consumers and businesses are benefiting alike. Many IoT startups working in Healthcare, Industrial, and General Sector are making a name for themselves. Ordinarily, IoT startup funding for wearables has diminished, but IoT Startups working in other sectors are enjoying a steady growth in funding. Quarterly IoT Funding Trend for 2016: Having raised $846 million in just three months, the first quarter of 2016 is racing to become the second highest IoT funding quarter after second quarter 2015.Since then, a whopping growth of 31% in dollars quarter-over-quarter came along as IoT startup funding. Although IoT startup industry earned dollars, number of deals did suffer in the same quarter. The number of deals dropped to 70 deals, lowest since the first quarter of 2014. Even though there was shrinkage in the number of deals, the average size and the amount of the deals increased quarter-to-quarter, which surely is a positive sign of growth. 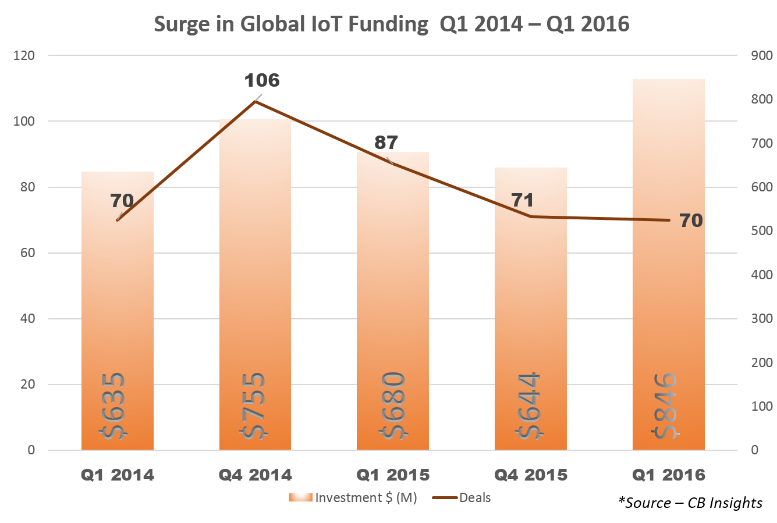 According to CB Insights IoT has witnessed a downfall in funding this year with a remarkable dent in dollar funding. If the trend continues, we should expect a 30% fall in deal activity and 7% decrease in the future IoT. This year has seen a lot of activity in IoT fitness wearables; accordingly, device makers grabbed the largest share of deals in the first quarter of 2016. Jawbone a device maker, Razer a gaming hardware maker and smart doorbell Ring received about $301 Series C and F funding in 2016. Quarterly Funding Trend of the Year 2016: If we consider the quarterly trends, you can witness a substantial downfall in the second quarter of 2016. In the first quarter of 2016 IoT funding was $837 million, which slid down to $ 656 million the second quarter. Subsequently the deal volume also sank to 62 deals in the second quarter from 75 deals recorded in the first quarter. Together Ayla Networks and Tado the smart thermostat earned a majority of funding ($23 million Series C) in the second quarter of 2016. Internet of Things has arrived definitely to stay. Although, there are some obstacles, a lot of activity is going around the IoT. The majority of startups in IoT will not have to worry from now on, as many VCs and other financiers, including some Blue Chip companies, are more than interested to fund an innovative IoT startup. Intel Capital, QUALCOMM Ventures, and Foundry Group are the three most active IoT startup investors. Along with them, Khosla Ventures, Andreessen Horowitz, Kleiner Perkins Caufield & Byers and three more are also looking for right opportunity and a perfect IoT startup to invest. 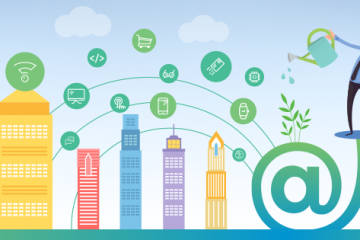 To make a mark and to get on their list your IoT startup needs to be different from thousands of IoT Startups trying out things to see how they work without having a goal. We at Sphinx Solutions have a focused IoT infrastructure and a team of professionals dedicated to leaving a mark. We do not believe in hard work we believe in smart work, come to us for any IoT related project, your satisfaction is our promise because excellence runs in Sphinx’s DNA.